Fri., April 5, 2019, 4:58 a.m.
On the first Thursday of each month, several businesses in Historic Downtown Kennewick stay open late to allow customers and curious folks to chat with business owners and artists. At one of Downtown Kennewick’s newer businesses, Prohibition Glass, visitors were recently treated to a display of glassblowing by the artisans from the local studio and shop. 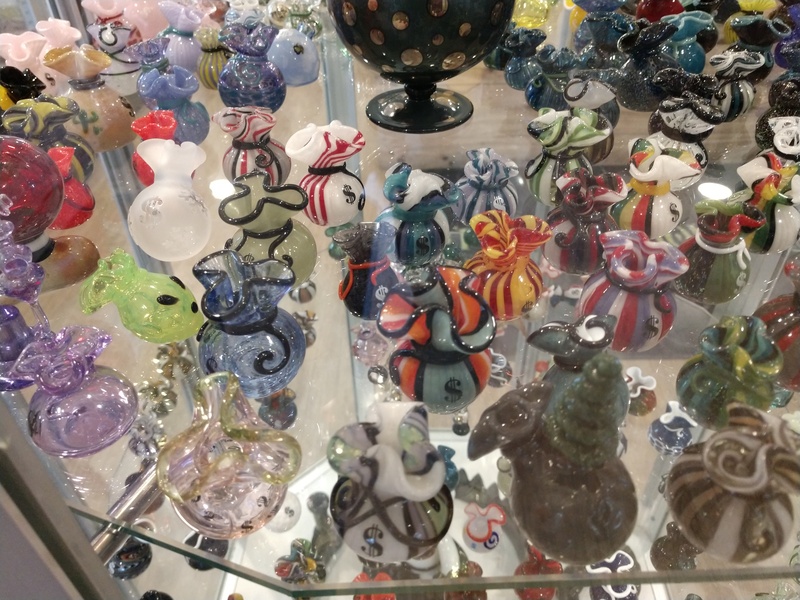 Watching the precise craftsmanship involved in creating one-of-a-kind glass items that sell for hundreds, perhaps thousands, of dollars, it’s certainly easy to agree that the common word “bong” just doesn’t fit. While it’s a long-standing joke that a true marijuana aficionado can craft a bong out of anything, items created here run the gamut from bare necessity to the priciest luxury. One visitor favors the term “paraphernalia,” which carries a professional connotation in some circles and an illicit one in others. “Glass art” works just fine. In the private showcase adjoining the glass blowing and glass sandblasting suite there are hundreds of pieces displaying the skills of different artists plus different eras by the same artist. There’s an 18-inch tall Megatron with a mini butane torch for his cannon. Here’s a bust of a Breaking Bad character. Other art pieces are modeled after everyday objects, like an old-fashioned soda shoppe sundae or a collection of glass sandblasted with a lace effect that would look at home in Grandma’s guest bedroom. The studio, size-wise, is somewhere between a two- or three-car garage. It features a large garage door on the back wall that can open to cool the room off quickly when several torches are going at once. The studio also doubles as an event space in warmer months. Beyond the aesthetic, a careful observer (or at least an observer with a good guide) will notice that glass technology is changing, along with the cultural influences, from traditional water pipes to early dab rigs to the latest innovations with peanut pipes. In comparison to some more functional medical devices where picking your preferred color is considered the height of innovation, the customization of original glass bongs is downright breathtaking. Standing in the glass showroom is a bit like standing in the middle of a colorful, 4D timeline of cannabis culture in the United States. The continuing federal illegality of cannabis has contributed to the underground culture of glasssblowing and makes the purchase of high-end paraphernalia a risky investment. Some collectors have said their pricy collections of glassware have been seized or smashed by law enforcement during arrests and raids. The dubious legality of custom glass inspired the name “Prohibition Glass,” according to co-owner Steve Lee. He said technically, the constitutional amendment that installed alcohol Prohibition in the United States made importing, producing, or selling booze a crime, but not buying it. However, the implementation of this law swept perfectly legal drink purchasers into the fracas. The same thing has been happening with marijuana prohibition, when artists and collectors sometimes find themselves or their glassware in similar legal jeopardy, whether or not they actually touch the plant. Today, Lee said Prohibition is a business with a mission. The artists don’t just want to sell beautiful glass; they also want to educate the public about glass art. Keeping the studio open late once a month for Art Walks is part of this mission. Another component is intensive, weekend-long, glassblowing workshops to help glassblowers hone their skills with expert guidance. These workshops are geared towards semi-professionals who already have basic knowledge but seek to hone their skills. Prohibition Glass hopes to offer more affordable, shorter workshops for novices when they can expand their space. Published: April 5, 2019, 4:58 a.m.